The 4I73 is PCI express to PCI bridge on a PC/104-PCI card. The 4I73 connects to the host CPU with a 5I71, a 6I71 or a Express card adapter and a standard PCIE one lane cable. 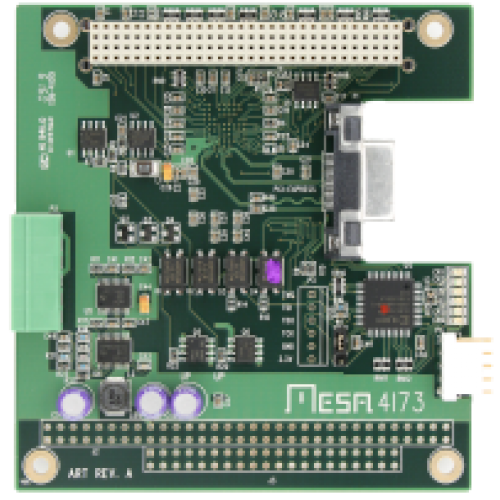 The 4I73 can allow data acquisition and wireless peripheral cards to be placed in ideal locations, which may be at some distance from the host CPU. The 4I73 also allows testing of PC/104-PCI cards without powering down the host. The 4I73 can be located up to 7 meters from the host computer. The 4I73 has a built in 3.3V power supply and can provide up to 2.5 Amps of 3.3V power to the remote peripheral stack so that only a single 5V power supply is required. On card high side switching is provided for externally supplied +12 abd -12V.